This 100% natural d-alpha tocopherol acetate has quickly become one of our most popular Vitamin E products to date. By incorporating only the finest source of d-alpha tocopherols, this completely unesterfied formula is available in five different potencies, and remains the least processed among all the products in our family of high quality E supplements. 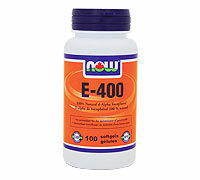 NOW® Vitamin E – quality you can trust. Free of: sugar, yeast, wheat, corn, milk. Other Ingredients: Vegetable Oil Concentrate, Gelatin, Glycerin, and Water.